An avenue of trees commemorates those from the district who served in World War One. The trees were planted on the 5th and 6th September 1919. 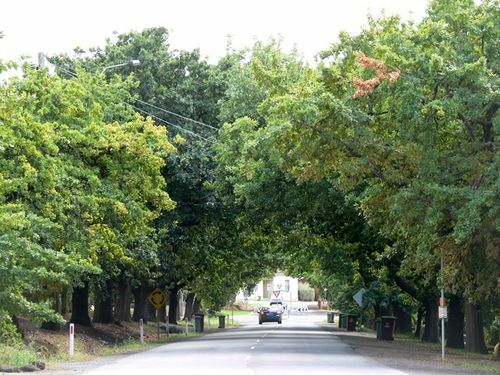 Sixty English Oaks were planted in this Avenue, which was officially opened September 1919 as a result of a community project, which involved working bees and donations, as well as afternoon teas provided by the ladies. The avenue was re-dedicated in 2004. The township presented a busy scene on Friday and Saturday last, when working bees were organised to plant an Avenue of Honor. The site chosen is on the road from the station, leading past the smithy, Church of England, and old store. It is in a good position, and one in which the trees —60 English oaks — should show to great advantage when well-grown. For every soldier who enlisted from the district, and for those on the school honor roll, a tree was planted, the ground having been previously plowed. The residents of Narre Warren North responded splendidly to the appeal for help. Some giving money, others their time and labor, and many both. Quite a number worked for the best part of two days, and a few came again on Monday for several hours to complete the job which meant, in addition to the planting, the building and erecting of 60 substantial tree guards. Only one refusal was met with from "the boys who stayed at home." The ladies dispensed afternoon tea on both days while the workers enjoyed half an hour's well earned rest. It has been suggested that, at an early date, suitable name plates should be affixed to each tree, when it is hoped that Capt. S. M. Bruce, M.H R., will be able to attend. On Saturday afternoon there was a large gathering at the Honor Avenue, Narre Warren North, when appropriate addresses were given by Crs. W. G. a'Beckett and R. H. Kerr, and Mr H. Barr, and the dedication ceremony was conducted by Cpl. Forsyth, of the Returned Soldiers' league. On the roadway approaching the township, 60 trees have been planted in honor of local soldiers, and these (in years to come) will have the effect of beautifying the place. Eleven of the trees are to specially honor men from the locality who have paid the supreme sacrifice. Miss F. Wollaston and Mr C. Bailey were hon. secretaries to the movement, and the function passed off most succesefuly. Local residents displayed a keen interest in the work of tree planting, providing tree guards, and erecting same, whilst Mr Walter Brown is deserving of special mention for his work in connection with the tree-guards which are now in position. South Bourke and Mornington Journal (Richmond, Vic), 25 September 1919.